LETTE sold its last macaroon on the boulevard last month. The tenant mix on Larchmont is ever changing. Despite new stores like Perverse Sunglasses moving onto the street, visitors are seeing more vacancies than usual along the blocks of Larchmont north of First St.
For ground-floor spaces, nearly 16 percent of the storefronts are now vacant (12 spaces of approximately 75). 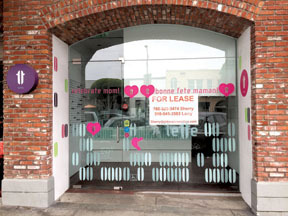 Lette Macarons recently closed, leaving the space at #122 vacant. Across the street, Z Pizza at #123, in an Albert Mizrahi-owned building, closing July 3, leaves another empty space. The former Coffee Bean and Tea Leaf at #135 is under construction to be a poké sushi restaurant. The former Nicole Boutique at #137 has a “for lease” sign. The former Kicks LA at #141 is vacant as well. On the east side of the street, Pickett Fences has moved from its original spot to the west side. Next to Pickett Fences’ former spot, Crumbs Bakery has closed, and Hans Custom Optik has relocated north of Beverly to #419, leaving three vacant spaces at #s 212, 214 and 216 available for lease. Jamba Juice is gone at #158. Landlord Tom Kneafsey indicated to the Chronicle that a new tenant may be in the space before the end of the summer. A few doors south and just south of the “Hardwear” clothing store (in the old Larchmont Hardware building, get it? ), the original Sam’s Bagels space at #150 is available for lease. Sam’s is still in business in a small space to the north of Hardwear. That also is an Albert Mizrahi-owned building. Mizrahi is remodeling another of his properties — the building at #227, which is the former Larch-Mart Grocery, then Jon Douglas, and most recently Prudential Realty. A sign attached to construction screening says there soon will be two 1,000 sq. foot spaces for lease, and sources say there already may be a tenant for one of the spaces. There is good news for one landlord, however. A long-vacant upstairs space on the boulevard soon will be filled. In the fall of 2016, Rhodes School of Music will move south from the building it now shares with the Larchmont Chronicle and other tenants in the 600 North block. The school will move to #215, above Burger Lounge (in the space that, controversially, almost became a marijuana dispensary several years ago). The new school will have more practice rooms, better soundproofing, and other beneficial features, says owner David Rhodes. Even with these dozen vacancies, Larchmont Blvd. maintains its neighborhood charm with classic stores like Larchmont Wine & Cheese Shop and Chevalier’s Books. The boulevard also has ushered in a new era of boutique stores like Diptyque and Malin & Goetz. With all the vacancies on the boulevard, neighbors and patrons will have to wait to see how the beloved street continues to evolve.